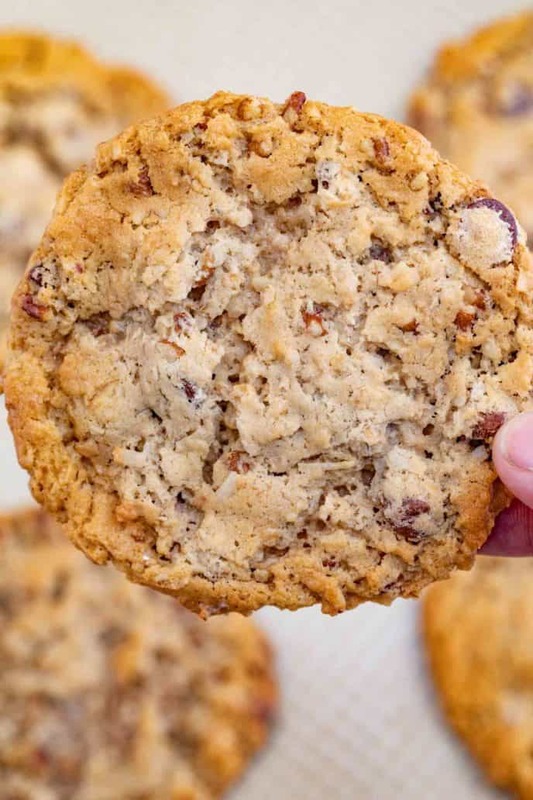 Cowboy Cookies are chewy oatmeal brown sugar cookies with chocolate chips, coconut and pecans that are done in less than 30 minutes! 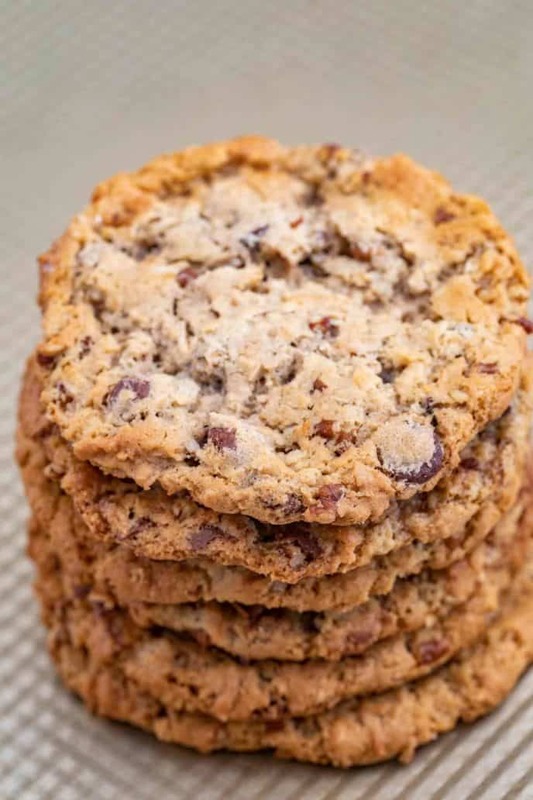 We love Chocolate Chip Cookie recipes including my favorite one, Caramel Chocolate Chip Cookies and these Cowboy Cookies are a dark horse favorite that won our Christmas Cookie Exchange competition last year along with the always famous Gingerbread Cookies. 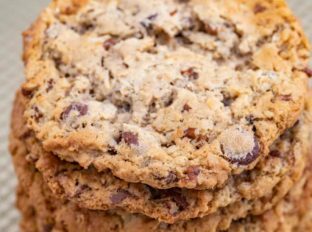 Cowboy Cookies are like a kitchen sink Chocolate Chip Cookie meets Oatmeal Cookie with lots of mix-ins or like a Monster Cookie without the peanut butter and m&ms. 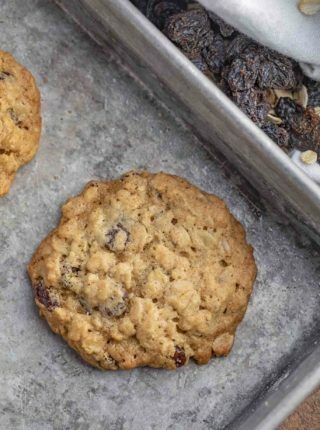 They have added coconut which adds a delicious chewy texture (the brown sugar in this recipe also adds a delicious brown sugar quality to the cookies too). The pecans add a crunch which makes them both chewy and crunchy like your favorite bakery cookies. These are my neighbor’s favorite cookie. I actually made a batch for testing, they loved them so much I have made them for every fun celebration and almost reason to celebrate since because they’re love them so much. Why are they called Cowboy Cookies? They are also sometimes referred to as Ranger Cookies but the origins of them actually trace back to politics! There was a cookie cook-off challenge in a Family Circle magazine issue in the early 1990s between Laura Bush when she was still a Governor’s wife and Tipper Gore and her “Texas Governor’s Mansion Cowboy Cookie” was a favorite that beat out Tipper’s Ginger Snap Cookies. 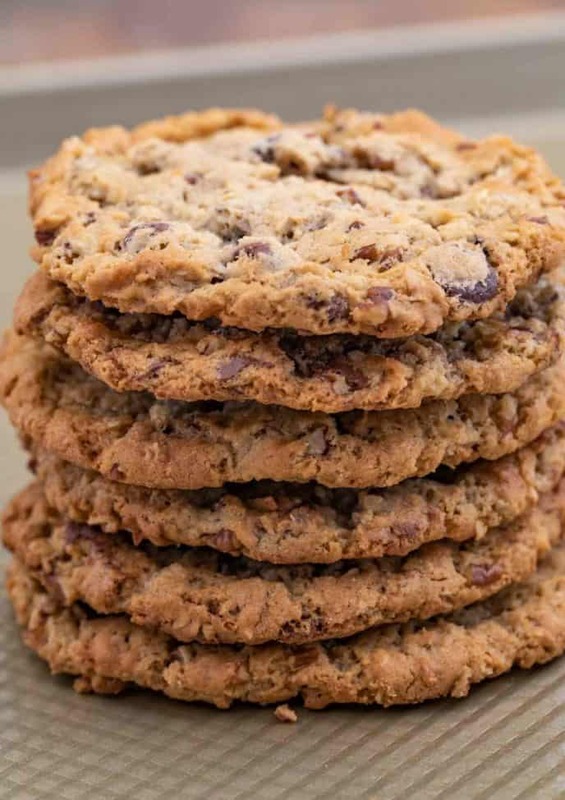 A second theory on why they’re called Cowboy or Ranger Cookies is just that with so many ingredients mixed into the cookies they’re heartier which is something cowboys who are out working would be able to appreciate. Use a combo of brown sugar and granulated sugar in your cookie recipe like we do in this one make the best cookies. Make sure you refrigerate your cookie dough balls before baking or they can flatten and get too crispy. 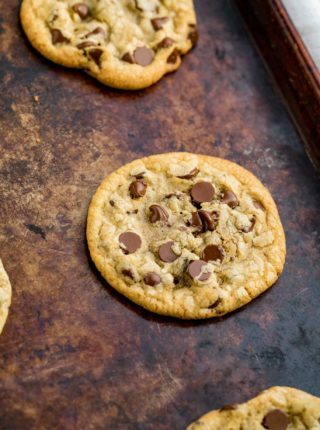 Cookies should be stored at room temperature in an airtight container or frozen if they won’t be eaten soon after baking. They will stay good for about up to 1 week but are more forgiving than most cookies because of the added shredded coconut. Use a good silicone mat. 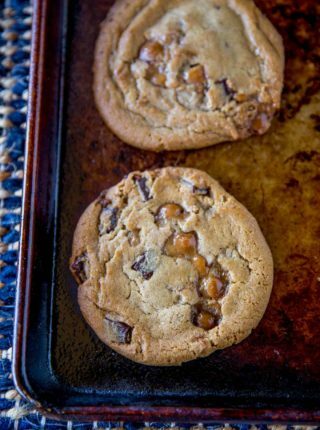 This prevents excess browning on the bottom of your cookies AND means you don’t have to worry about them sticking since we have caramel in these cookies. Preheat your oven well ahead of time and check the temperature with an oven thermometer. Store them in a good tupperware container (and include a slice of bread to keep them fresh). Make sure to only mix in the flour mixture until just combined to prevent flour from being over mixed. Use an electric mixer to beat the butter and sugar well until very light and fluffy before adding in any more ingredients. Preheat oven to 350 degrees and to your stand mixer add the butter, sugar and brown sugar on medium speed until light and fluffy, about 1-2 minutes. Add in the eggs and vanilla until fully combined then sift the flour, baking powder, baking soda and salt together and add it into the stand mixer on low speed until just combined. Add in the oats, chocolate chips, coconut and pecans until just combined. Add 2 tablespoon sized scoops of dough to your baking sheets and bake for 12-13 minutes, letting them cool before removing from the baking sheets. This is my kinda cookie! Thanks for sharing. I need to make a double batch of these! Yum. Yum! I can’t wait to make these! The history behind the cookie is also cool and unique. These are really amazing cookies! My kids can’t wait for me to make them again! Thanks for coming back to let me know how much you guys loved them. 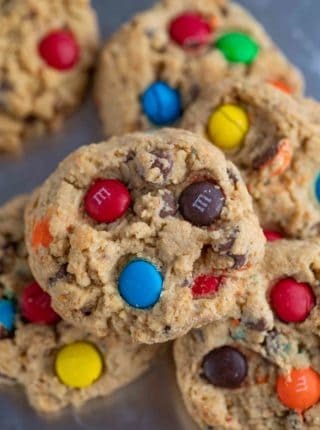 One of my new favorite cookie recipes! Yay!! Thanks for the 5 stars. Definitely time to make them again!